The fisherman in the title is not a common working man but a scholarly ideal: a gentleman fisherman living an idyllic life, enjoying nature and the pleasures of companionship and wine. The original preface, below, has him living along the Song Jiang (river),4 which flows eastward from Tai Hu (the Great Lake5), passing south of Suzhou, then through the area which is today Shanghai. This early version of Zui Yu Chang Wan is musically unrelated to the melody of this title played today. Zha Fuxi's Guide lists the title in 17 handbooks from 1525 to 1946.6 However, these 17 can be further sub-divided in three: two versions of the original melody, later versions of this, and the modern melody. The original melody, found in the first two handbooks: 1525 and 1557. These two are nearly identical: the 1557 preface gives a different attribution, but it also has 10 sections and the same section headings. An elaboration of the first melody, earliest found over 100 years later in the third handbook Dahuange Qinpu (1673; X/387). It has 12 sections7 and is more elaborate; it seems to be the source of all the later versions up to Tianwenge Qinpu (1876). The modern version,8 the first surviving occurrence of which is also in the 1876 Tianwenge Qinpu, which attributes it to the Sichuan qin player Zhang Kongshan. This modern Zui Yu Chang Wan, one of the most popular pieces in the current active repertoire, generally has six or seven sections. Lu Guimeng spent most of his life living in Fu Li,18 a village near Song Jiang. The qin handbook Qinshu Daquan19 includes several poems by Lu which praise the qin. 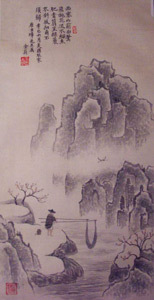 One, called For the Old Man of Zixi, mentions a drunken fisherman. Pi Rixiu, from Hubei province, came to the Suzhou area as an adult. Lu and Pi soon became very close friends; they wrote many poems together and also had a reputation for singing together. This, as well as their association with fishing and drinking, may be the reason for the attribution to this duo, rather than any specific melodic invention on their part. Peach blossoms flow in the water and the mandarin perch are fat. with slanting winds and fine rain, there is no need to return (to public office). As Lu Luwang and Pi Ximei were floating in a boat on the Song River they saw an old fisherman drunkenly singing, and accordingly wrote this song. I think its flavor is as good as (that of Zhang Zhihe's famous poem which includes the lines,) "In front of Xisai Mountain...peach blossoms flow in the water." Standard tuning can also be considered as 5 6 1 2 3 5 6. For more information on zhi mode see Shenpin Zhi Yi. For modes in general see Modality in Early Ming Qin Tablature. By 金蔚 Jin Wei; see details. This river is now generally called the 吳淞江 Wusong River. In English it may be called Suzhou Creek, though this was especially used for its last mile or two before joining the Huangpu River at the north end of Shanghai's Bund. The whole area around Suzhou is dotted with streams and canals that have sometimes changed course. One noteworthy area near the current course of the Wusong is the ancient town of 甪直 Luzhi (Shanghai Culture); apparently the Fuli of Lu Guimeng, it is just north of 澄湖 Chenghu (Lake Cheng). A bit further south is 淀山湖 Dianshan Lake (China Culture and Wiki) plus another "ancient town", 朱家角 Zhujiajiao (Wiki and Wiki Travel). "Tai Hu" literally means "Great Lake"; this not being immediately obvious to non-Chinese speakers, it is often called Lake Taihu. The chart below is based mainly on Zha, Guide, 20/186/--. To sum up the information in the chart, none of the tablatures sets the melody to lyrics (though see 1946). All of the versions published before 1876, and at least three later ones, present the earlier version. However, no one other than myself seems to be playing any of the earlier versions. 古琴曲集 Guqin Quji Vols. 1 and 2 transcribe three performances of the new version (6 or 7 sections). The commentary says it appears earliest in 1525, and quotes the 1525 commentary, without mentioning that the melodies are musically unrelated. It should be noted that people who have learned one of the versions of the Zui Yu Chang Wan commonly played today usually do so from recent copies of tablature not from any of the handbooks listed here. The two sections are added by dividing Sections 5 and 8 into two sections each, but there is also further expansion of the music. The modern version of Drunken Fisherman Sings in the Evening first survives from Folio 7 of Tianwenge Qinpu (1876; this handbook also has a version of the earlier melody at XXV/275.) There is no commentary with the new version other than that it is "by 張孔山 Zhang Kongshan". It is thus one of the handbook's eight melodies as played by the famous Sichuan qin player 張合修 Zhang Hexiu, better known as Zhang Kongshan (see Xu Jian's Qin History, Chapter 9 [p.174]). This new version quickly became one of the most popular melodies in the repertoire, with the effect that the musically unrelated earlier version soon disappeared and several varieties of the new version emerged. A recording of Zha Fuxi playing one of the modern versions can be heard on the website of Jim Binkley. See further commentary in the main entry. 17777.56 and the following entries have nothing about "autumn thoughts" or the people mentioned here. This is the earliest surviving version of this title. Dongting Qiusi only precedes Zui Yu Changwan in the 1525 and 1689 handbooks. 調終 "diao zhong" is often used with these short pieces; 曲終 "qu zhong" was generally used for the longer ones. For example, in my transcriptions compare m. 30-32 and 42-3 of Dongting Qiu Si with m.266-8 and 315-8 of Zui Yu Chang Wan. Near the southern end of the lake there are two hills/islands that on older maps were still called, respectively, either 東洞庭山 East Dongtingshan and 西洞庭山 West Dongtingshan, or 洞庭東山 Dongting East Mountain and 洞庭西山 Dongting WestMountain; these maps may also still show 洞庭 Dongting as a name for that end of the lake. However, modern maps generally shorten the names of the two hills/islands to East Mountain (東山 Dong Shan) and West Mountain (西山 Xi Shan). In addition, the islands seem to have been considerably enlarged through landfill. Lu Guimeng (42620.407 陸龜蒙, 字魯望,號江湖散人, 等; also Giles and Nienhauser), literary name Luwang, nickname Jianghu Sanren, etc., was a 9th century poet who abstained from fine food, alcohol, festivities, etc., instead floating on a boat with his books, fishing tackle and equipment for making tea. He was from 長洲 Changzhou, now part of Suzhou, but after retirement is said to have3 made his home in Fuli (see below). An editing of the Classic of Tea (茶經 Cha Jing) by 陸羽 Lu Yu (d.804). A preface he is said to have written for a qin handbook that consisted of melodies as played by Chen Kangshi. A poem under Chun Si. A friend of Pi Rixiu, Zhang Zhihe (10026.366) was also a famous poet; the poem quoted here (see 100 Tang and Song Ci Poems, #5) was popular even in Japan. Tales of Immortals (Foreign Languages Press, Beijing, 2000), p.93, tells a story about him. It says he was a fine scholar, legendary drinker, master of qigong and an excellent painter of plants, animals and landscapes, especially fantastic scenery. The modern name of Fu Li is 甪直 Luzhi (Wiki; see also Song River above). One of the nicknames for Lu Guimeng was 甫立先生 Mr. Fuli. This poem was particularly popular in Japan. 35587.587 西塞山 says it is in the southwest of 吳興縣 Wuxing county, placing it near the southern end of Taihu. Although there seems to be some mention of Xisai Mountain in local tourist literature, it does not appear on modern maps. Google maps, for example, put it on the south bank of the Yangzi River just downstream from 黃石 Huangshi (midway between Wuhan and Jiujiang), a local tourist literature there claim that Zhang Zhihe's poetic reference is to here. There was an opera called 西塞山漁翁封拜 by 楊潮觀 Yang Chaoguan (Qing dynasty). Sleepy from drink they look vacantly at the morning village noise. The mist and ripples (mountain and river scenery) are ancient. In such tranquillity, who could have earthly worries?'" The second verse (明月太虛....) is commonly quoted on the internet, usually in connection with Zui Yu Chang Wan, but not mentioning that the old melody is unrelated to the modern one. The verse is also mentioned in connection with Evening Song from a Fisherman's Boat (漁舟唱晚 Yuzhou Chang Wan), a melody found in the repertoire of the guzheng and perhaps other Chinese stringed instruments (18586.22 has only 漁舟). Note that 17924.99 traces the phrase 浮家泛宅 to a biography of Zhang Zhihe, saying he was asked to serve the government, but preferred doing this. Shu Huai Cao (QQJC XII/362; 1682), which says the melody is in 商調 shang mode, with lyrics added by 新城王士禎阮亭 Wang Yuanting of Xincheng. Its lyrics begin, "褐坼新篁斜礙路，孤亭盡日幽禽語。...." and follow the ci structure, as with the poem quoted in the preface above. Song Sheng Cao (QQJC XII/406; 1687); same lyrics but different tuning and melody. A third version, in Ziyuantang Qinpu (XVII/544; 1802), has the same lyrics (and also attributing them to 王阮亭 Wang Ruanting) and music as 1682 but incorrectly says the mode is 徵 zhi. Perhaps this is because Zui Yu Chang Wan is in zhi mode, but to my ears this Yu Jia Ao does not seem modally related, at least to the early versions of Zui Yu Chang Wan. Zhang Yuangan (10026.117 張元幹，字仲宗), literary name Zhongzong, was from 長樂 Chang Le, of which there are many, though none by Tai Hu. As with Lu and Pi, Zhang is not mentioned in any later introductions. Some of his poems in the Complete Song Ci (全宋詞，中華書局，卷二 , pp.1072-1104) mention drinking and fishing, but he is perhaps better known for his patriotic verse at a time when north China was being taken over by the Jin. His poem cited with the introduction to Zui Yu Chang Wan in 1557 is quoted above. Wuzhizhai Qinpu (1722) begins by saying, "醉漁唱晚為後世隱流所作。亦古調也 Zui Yu Chang Wan was created by a recluse of recent generations; it is also an old melody...." This and several other handbooks claim that it has a musical affinity with (the standard tuning version of) The Fisherman's Song (Yu Ge [徵調]漁歌 ), which appears first in Wugang Qinpu / Qinpu Zhenchuan (1546/7); the second occurrence, in Xilutang Qintong, seems to be a more accurate version. Further comment above; based mainly on Zha Fuxi's Guide 20/186/--. (>1802; XIX/262) 12T; zhi yin; "吳官心譜 tablature of Wu Guanxin"
(1875; XXVI/261) 12; zhiyin; "compared versions of 徐青山 (1673) & 尹芝仙 (1647!!!)" (1876; XXV/275) 12T; "商音 shang yin 羽調 yu diao" but "= 1702"
Return to the top, to the Xilutang Qintong ToC or to the Guqin ToC.